Electri-Flex Company recently launched an award-winning line of Stainless Steel Jacketed Flexible Electrical Conduits. 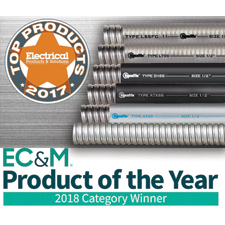 This line of conduits won the 2018 Category Winner with EC&M Magazine - Product of the year, and also won the 2017 Top Product Award with Electrical Products & Solutions. The benefits of utilizing a stainless steel flexible conduit is that it provides exceptional resistance to corrosive atmospheres, such as chemical processing, water treatment plants and other specialty applications where standard plated steel may not be adequate. It also provides additional high mechanical strength due to its construction. Type LSSFG is a Food Grade conduit solution, ideal for Food Processing and Pharmaceutical facilities. The flexible PVC jacketing is made from an FDA-approved compound and the core is a corrosion-resistant continuous strip of 316L stainless steel. LSSFG meets FDA CFR21 and NSF 51/61 requirements and is a Certified Component for NSF/ANSI 169 special purpose food equipment. Type LTSS has a flexible PVC jacket over a corrosion-resistant continuous strip of 304L stainless steel core. LTSS is an Industrial Grade solution, designed for a variety of installations requiring motion, vibration and bending. It is both UV and oil resistant. Type ZHSS is made from a zero-halogen polyurethane jacketing that provides low-smoke, low-fire hazard, low-toxicity and self-extinguishing characteristics. The core is a corrosion-resistant continuous strip of 316L stainless steel. ZHSS is designed for applications where safety concerns exist regarding a material’s reaction in a fire and is resistant to UV, ozone, hydrocarbons and moderate chemicals and oils. Type ATXSS is an Extreme High/Low temperature conduit solution, providing a working temperature range of -60°C to 150°C (Intermitting to 165°C). Its flexible thermoplastic rubber jacketing provides a halogen-free, UV-stabilized, extreme high/low temperature range, with a flame rating of UL94-HB. The core is made of a corrosion-resistant continuous strip of 316L stainless steel. Type ATSS is an All Temperature conduit, made with a flexible PVC jacketing that offers working temperatures of -55°C to 105°C (Intermitting to 120°C). The core is made from a corrosion-resistant continuous strip of 316L stainless steel. ATSS is designed for corrosive applications in high / low temperature environments. Unjacketed Type SSL stainless steel conduit is available as a corrosion-resistant continuous strip of 304L, but is also available in a 316L stainless alloy. It is designed for corrosive applications that do not require a jacket and is extra flexible for tight bend applications. To download the Stainless Steel Sales Guide, visit https://www.electriflex.com/resource-library/ or email marketing at mktg@electriflex.com. Electri-Flex Company, a leader in electrical conduit design and manufacture for over 60 years, produces Liquatite®, the most diverse line of liquidtight flexible electrical conduit in the industry. The company offers custom design, engineering, quality assurance and testing capabilities. For more information on Electri-Flex Company, call (630) 529-2920 or (800) 323-6174; fax: (630) 529-0482; e-mail: mktg@electriflex.com; visit: www.electriflex.com; or write: 222 West Central Avenue, Roselle, IL, 60172-1994.